- This'll keep you busy. Time lists the 50 best sites of 2007, and I haven't heard of half of them. - Calling all bowlers, achievers, marmots and nihilists...LebowskiFest is coming this weekend. - Virginity has its rewards...like free tickets to a off-Broadway show. Can't think of another. - What? You didn't think there were any poker-playing babes? Well, you'd be correct on that. 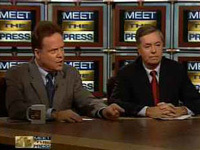 - And Senators Lindsay Graham and Jim Webb have a very calm discussion on Meet The Press.